Sharpen your knife, sharpen your life! The Sharp Brothers sharpen knives, scissors, garden equipment, swords, loppers, paper cutters, hatchets, brains and much, much more. Our Shorewood, WI shop offers a 24-hour turnaround dropbox, sharpening by appointment, and drop in service. During the summer we appear at many farmers markets in the greater Milwaukee area. The Sharp Brothers also operate in the San Francisco / Oakland Bay Area. Gift Certificates available! Give us a call or send us an email to arrange! Come visit our sharp octopus mural painted by Stacey Williams-Ng! Looking for Sharp Brothers California? 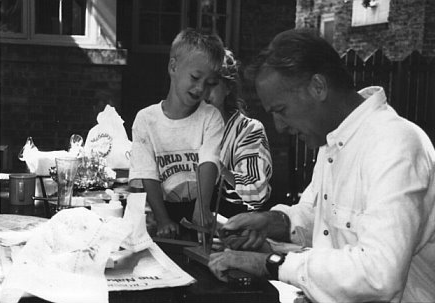 Lee and Austin Sharpening in their backyard, early 90's. I used to live in Whitefish Bay and there was never any question where to get my knives sharpened: the Sharp Brothers do an amazing job for what some would call reasonable rates but what I call the lowest price you can imagine. They do it politely and, though they say 24 hour turnaround, it’s usually a matter of 3-4 hours. We'll sharpen your knives while you wait! When you book an appointment online, show up at your reserved and confirmed time and we'll have a sharpener waiting, ready to sharpen your knives on the spot. Walk-ins or drop offs using the dropbox are still guaranteed 24 hour turn around, but if you want immediate turn around, book online now! Please note: Booking times are for items like knives and scissors. Please contact us for items like push lawn mowers, paper cutters and other large items.